Considering my enthusiastic reaction to its eShop demo, you'd think I would have ripped the Rhythm Thief & The Emperor's Treasure cart from its packaging and slammed it into my trusty 3DS system as soon it arrived on my doorstep late last week. That's exactly how I would have reacted, actually--had Theatrhythm Final Fantasy not beaten Rhythm Thief & The Emperor's Treasure to the punch (not to mention to my mailbox) by a few days. You see, I've quite literally become entranced by Square Enix's Final Fantasy-themed rhythm title. In fact, I've played little else since I obtained my copy of the game nearly two weeks ago. 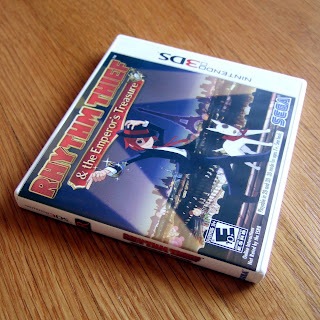 I didn't want to leave you guys and gals hanging with yet another "yeah, I added another game to my collection, but I haven't had a chance to play it yet" post, though, so yesterday I forced myself to replace Theatrhythm Final Fantasy with Rhythm Thief & The Emperor's Treasure for a while. As for what I thought of my rather cursory experience with this Sega-developed release: Well, for starters, all of the folks who have described Rhythm Thief as "a mash-up of Professor Layton and Space Channel 5" deserve some sort of prize, because that's pretty much how this peculiar title plays out. Not only that, but the rhythm segments, while enjoyable, aren't as deep as I'd hoped they'd be. Granted, I've only played five of them thus far, so it's altogether possible that they'll gradually increase in complexity. Given all of the above, I think it's fair to say that I'm currently on the fence about Rhythm Thief. I'm enjoying it, but I'm also feeling a bit disappointed by it. I'll keep plugging away at it, though, and I promise to share my final thoughts on the matter (in an upcoming "Great Gaymathon" review) as soon as possible. I still haven't ordered it. I'm not really waiting for any reason except that we have a lot coming up (trip to Saugatuck tomorrow, Indy Gen Con in August, etc...) that I'll need money for, so...I'm trying to be a little conservative. That being said, if it comes down in price, I'm sure I'll snag it, no questions. Are the puzzles satisfying at all, Bryan? Or is it sort of watered down for general audiences? I played it trough a couple of months ago and I enjoyd it! Although I would like them to crank up the whackyness quite a bit in both the rhythm-parts and the puzzle/story bits as well. Compared to both Ouendan and Layton it's not as great as it could have been, but I liked it for what it did anyway. Justin: I don't think waiting to buy it will cause any problems for you. It's likely to only go down in price for some time, although I guess eventually it could become hard to find, as I doubt Sega shipped a ton of copies. Still, I wouldn't worry about waiting if I were you. Oh, and as for your question: Honestly, I've only encountered a few things that could be considered puzzles so far, and both of them were pretty disappointing. Very basic and very short. Really, they should have left them out if this is all they're going to do with them. We'll see, though, maybe they, too, will become more complex as time goes on. So far, Justin, the bulk of the game is spent in a very Layton-esque story mode. You traverse an overhead map (that looks kind of like a board-game board), and whenever you reach a new destination you're able to "explore" it a la Layton (you can click on parts of the background to find coins/medals and also click on people to talk with them). Every once in a while, a puzzle (of sorts) or a rhythm game is thrown into the mix. It's all very well done, by the way. My only complaints so far are that the puzzles are hardly puzzling, the whole "click on the background to find coins" schtick doesn't really interest me, and the rhythm games are too few and far between (and maybe not "deep" enough). Hey there, Linnea! Oh, yeah, you guys got this one some time ago, didn't you? I'm glad to hear you liked it overall, by the way. I'm going to try to finish it this weekend so I can write up a review next week. Hopefully I'll end up liking it as much as you did! Hey there, Jordan. Thanks for the comment! I'm amazed that you beat this game in a single day, by the way. You must've been really into it to play it for that long! Anyway, I agree with you that Sega suggested a sequel at the end of the game. Unfortunately, I'm not sure I believe we're ever going to see one -- unless the iOS version of the game sells really well. My reasoning? As far as I'm aware, this game didn't sell well in any region. BTW, I actually reviewed this game last week. I have a feeling you won't like my review, though, as it wasn't entirely positive. Don't get me wrong, I liked many aspects of the game, but I also didn't like others. Still, I'd probably pick up a sequel if it addressed some of my issues with the first game.